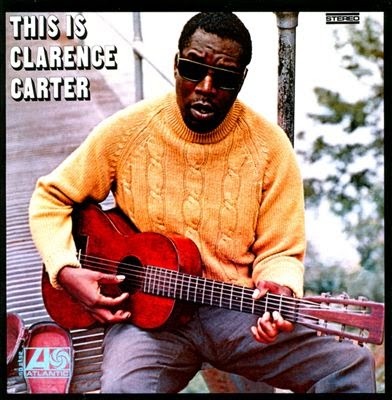 Clarence Carter was born in Montgomery, Alabama in 1936. He was blind from birth, and grew up listening to blues records, teaching himself guitar along the way. In 1960 he graduated from Alabama State University, majoring in music. He formed a duo with another blind classmate, Calvin Scott, and as Clarence & Calvin they recorded a number of R&B singles in the early 60s, released on a variety labels, but none of them charted. By 1966 they were performing live in Birmingham, but after Scott was injured in an auto accident they went their seperate ways. Carter's solo career began with him recording at Rick Hall's Fame Studios in Muscle Shoals, Alabama. His own song "Tell Daddy" was released on the Fame label, and became a #35 R&B hit. It was covered the same year by Etta James, who took it even higher up the charts as "Tell Mama". Carter's next single, "Thread The Needle", got to #38. He then signed with Atlantic Records, and "Looking For A Fox" got to #20. His real breakthrough hit came in 1968 - the brilliant "Slip Away" got to #2 on the R&B chart but crossed over to #6 on the pop chart. His debut album came out the same year, an excellent collection of gritty southern soul numbers, highlighted by Carter's distinctive baritone and the great instrumentation from the Muscle Shoals musicians backing him. It featured all his recent hits with the exception of "Tell Daddy", plus some more good originals, a couple from the partnership of Dann Penn and Spooner Oldham, and a fine country-soul fusion with Curly Putman's "Set Me Free". Link goes to the Dan Penn albums.